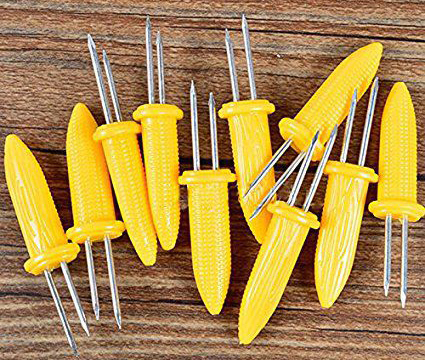 There are two types of people in this country – those who eat corn on the cob with those little corn holders with metal prongs and those who don’t. We are among the group without corn holders. Years ago we had some, but the prongs got bent, half of them went missing and the half that didn’t go missing wound up mangled in the garbage disposal. The purpose of corn holders is to keep you from getting butter on your fingers. But isn’t that the point of eating corn? It’s not strictly about the corn; it’s about the butter. Lots and lots of melted butter, and salt and pepper and the wonderful combination thereof. Let’s be honest—eating corn on the cob is one of the most unsightly spectacles that occurs at the family dinner table. (Not like that’s going to stop us.) Using corn holders isn’t going to somehow make eating corn on the cob an aesthetically pleasing experience. Eating corn on the cob requires lunging, grappling and attacking with bared teeth. You bite down and the corn squirts. It may squirt into your eye, across the table, or across the table and into someone else’s eye. Not even silver-plated corn holders could make eating corn on the cob a class act. A friend who lived abroad once said that the French believe the only ones who should eat corn on the cobs are pigs. Leave it to the French to once again make us feel inferior regarding food. Most of our grandkids are too young to have mastered the art of eating corn. They nibble—a nibble here, a nibble there. The end result is a half-eaten ear of corn that looks like a mass of divots on a golf course. I tell them to eat across the cob, from left to right, the same way they read. I tell them that eating corn in a row will make them better and faster readers, one day give them better test scores and get them into the best colleges. I also tell them not to worry about being untidy, that if you eat corn the right way, it’s bound to be a mess. If you eat corn on the cob the right way, you should have butter smeared on your chin. How’s a corn holder with two sharp prongs going to help that? You might also have kernels stuck between your teeth. I suppose you could use a corn holder to pick them out, but let’s not give the French any more ammo. If you’re one of those people self-conscious about eating corn on the cob, I give you permission to liberate yourself from the normal restraints of polite dining.